I know what this question entails so please try to keep it to experience and proven science. I experienced a positive result with a Wireworld Starlight USB cable. I brought my laptop, DAC and headphones in to listen to some 2 channel speaker amps at a local A/V store. While listening to one amp for about an hour, the manager came in and asked me to try a USB cable and walked away. I was in the middle of a song so I finished it, replaced the cable and replayed it. I immediately heard a better presentation. I notice the micro details of a song. The way an instrument sounds, the reverb of a body of a cello, etc. I thought I could hear a heightened clarity, quicker dynamics in the song. All I've read says you can't impact the digital signal with a cable but this certainly caught my immediate attention. Wireworld explains it's jitter reduction by geometry and separating power from signal as well as silver clad copper makes a difference. Can a USB cable make an audible improvement to the analog signal? Am I experiencing placebo bias? The equipment was static, including the volume. The only change was the cable between the laptop and DAC. Chain was Sony i3 core laptop playing foobar/ASIO flac & 24/96k vinyl rips into a Lynx Hilo DAC, balanced out to a Simaudio Moon 340i 2 channel amp into a pair of HE-6 headphones. USB cable quality and length can effect the performance. I seem to recall the maximum length of cable (without a booster, (signal repeater)) is 15 feet. Some audio devices today us asynchronous transfer which reduces the cable quality factor, as I understand. I'm getting a lot of commentary from science types claiming snake oil and placebo. But digital signals is still analog square waves. If the magnitude or phasing were offset with errors in cabling, it would have an impact on the timing of information received. 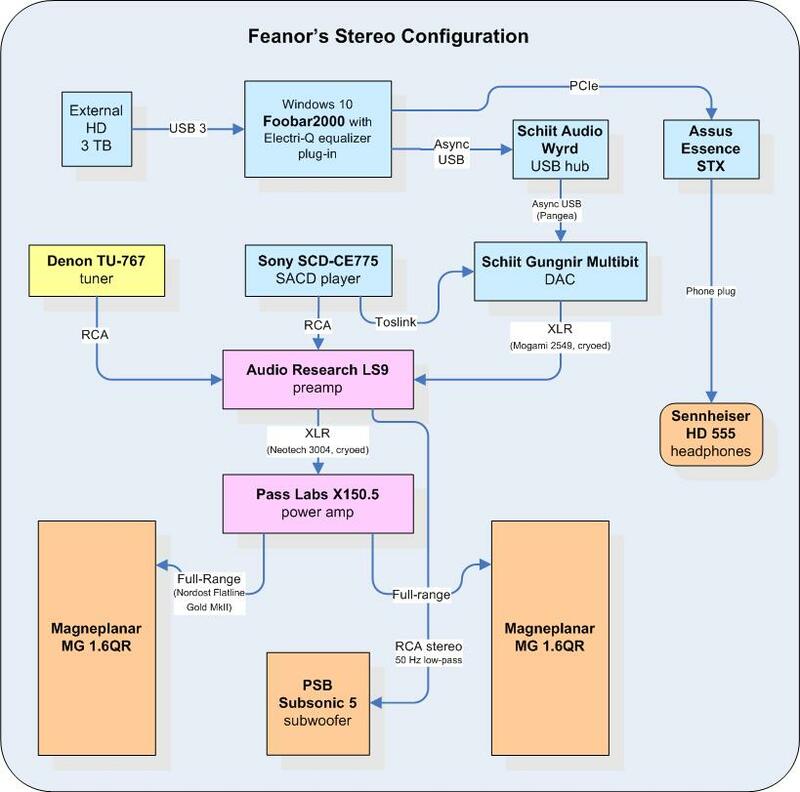 While Audioquest is discussing issues involved with the physics, two DAC designers are also involved in the discussion so I give a bit more credit to the explanation. Hansen, Rankin, et al., are exactly the guys who would say that, but there is truth to it. As I understand, the digital signal -- each bit -- is comprised of square wave. But a true square wave would require infinite bandwidth: this is impossible. So I guess the best cable is the one that will deliver the most nearly perfect square wave; purer copper/silver, thicker gauge, and shorter length (of course) will deliver wider bandwidth. If the form of the square wave is too rounded, timing in particular will be adversely affected. This is why the maximum USB per official specification is only 15 feet. Then again none of that necessarily justifies $500 for a 3 foot USB cable; chances are the $5 3' cable will work well enough. I am on the fence about this one to. It is a digital asynchronous signal going from the source to the dac and I do use a $80 USB cable and it works well but after some of the reading and studying I have done on this I wonder if I would have bought a $5 cable from Monoprice if I would have had the same results. I guess it is something I could and should try some day. While money and value is relative, this cost $100 so I was willing to believe my impressions. Now that I'm putting some homework into it, I'm wondering. I've read of many who have heard similar to what I "think" I heard. But I may also be paying attention to justification research. They differ as digital signal (square wave) contain harmonics frequency where (pure) analog sine wave does not. And timing of digital signal occur where the signal changes polarity, not magnitude or phasing. However magnitude can effect the signal timing if its value fall below or above digital signal's positve or negative threshhold value. As I understand, the digital signal -- each bit -- is comprised of square wave. But a true square wave would require infinite bandwidth: this is impossible. So I guess the best cable is the one that will deliver the most nearly perfect square wave; purer copper/silver, thicker gauge, and shorter length (of course) will deliver wider bandwidth. If the form of the square wave is too rounded, timing in particular will be adversely affected. We have been hearing from the time CD players came out in the 80's that digital is digital and it will sound the same no matter. We have found out different. I can hear differences in digital cables linking a CD player to a receiver, so why not differences in USB? Have not experienced it myself but can believe it is true. I just found out a power cord can make a difference in sound and did not think that was possible. I send my computer player output to my Schiit Bifrost Uber DAC via USB asynchronous. Because I need a long, 15 foot=5 meter run from the computer to the DAC I decided to upgrade my USB cable from a $5.00 special to this Pangea Audio with PCOCC (Pure Copper by Ohno Continuous Casting) copper with 4% silver plating; (see HERE). Sounds great but I'm really not sure that it's better than the $5.00. I might try some swapping. I know a guy that has a $600 usb cable that is as thick as a garden hose. He swears that it made a huge difference in sound.